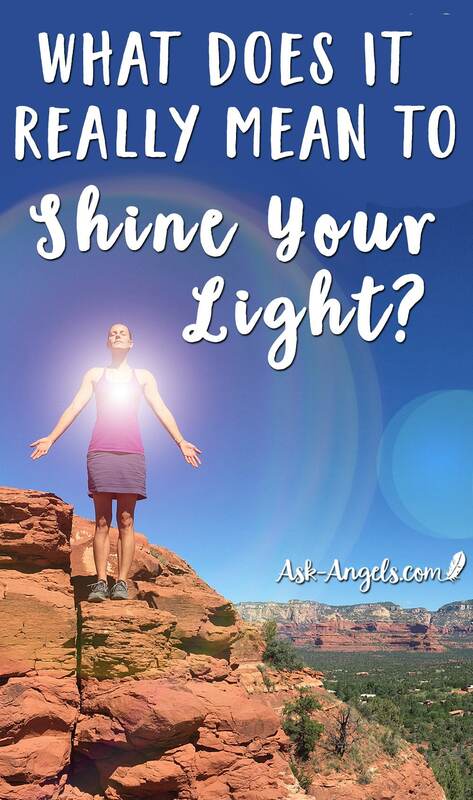 “When we in the angelic realm encourage you to shine your light, we are specifically speaking to your realigning with the higher dimensional aspects of your true divine nature and anchoring your innate spiritual connection into the physical. This connection is empowered through your presence in the moment and through your willingness to open your heart and consciously expand your vibration. Expansion is made possible through letting go of the preconceived notions and judgments about how your work and service and life should unfold and rather surrendering fully to the present moment. Surrendering to this process of fully experiencing the love and light that you are. When you fully experience the higher dimensional radiance that is your divine truth, you can let go of the ego's desire to judge and compare you against others and the service they’re doing in the world. And rather, you begin to step forward one step at a time from this present point in time on your path of ascension. Stepping forward on your path of raising your vibration through spiritual practice, through meditation, through clearing your vessel — mind, body and spirit — to become a clear conduit for the immense and brilliant divine being you authentically are, accessing your multidimensional awareness, and integrating the guidance and light of your higher self. When this guidance is intact, when this flow of intuition is open through raising your vibration and yes, responding with love in the present moment and keeping your heart open, you are then able to shine your light simply through your being, through your radiating love, through opening your heart and allowing your ascension column to open. Through allowing the toroidal energy flow of your light body to ripple out far beyond you so that in every moment, you are infusing your surroundings with the divine light that you authentically are. This is the foundation of shining your light: simply being. And then once you are present and grounded in the higher vibrational manifestation of anchoring your higher self and your divine being, your divine blueprint into the physical, you can then take steps in alignment with your inspiration, in alignment with your intuition to co-create in the world. And the answer to this question of how you may serve in alignment with your highest joy in a way that makes a difference in the highest interest of all, is shining your light. And so, shining your light yes, is twofold. It is your very vibration and your energetic signature. Shining your light comes about through healing and restoring the divine blueprint and template for you as an embodied light being in physical form, and then living as an embodied light being who understands that you are here to create. And so, what are you creating? Shine your light forth through your writing, painting, through the physical, tangible manifestation, in whatever way creative life force energy seeks to flow through you … Creating in the physical from this heart-centered, light-infused mode of living, so that you are fulfilled and in joy and in love, making a difference in the highest interest of all. Shine your light and then recognize that when you shine light in this way, your ego may be threatened by the new level of vibration and the growth you’re stepping into. Ego may trigger you to judge your creations, to deem yourself as unworthy, as not doing enough, not making a difference in a way that is as profound as other people you are looking at. Let yourself honor you as you are in the present moment, and release that voice of ego, the voice of judgment, and know that the present moment is ever the opportunity for you to shine your light. Love yourself exactly as you are and know that whatever flaws you see in yourself, whatever gifts you see in yourself, in whatever level of development they are currently at now, this is what you have been given to create with. When you create with what you have now — when you put out from your heart your creations, shining your light to the full extent you are able to, in this here and now — that is when you grow, that is when more of your gifts become available to you, that is when you progress to then receive more profound insights. And then when you act upon these insights, this cycle of growth, ascension, raising your vibration and serving at a higher level becomes empowered… By simply shining your light as you are now. Another trap of the ego on this path, happens when you see the big picture of what is possible for you and then become overwhelmed at the gap between where you are and where you see that you can be. The way that you get from where you are now to where you see you can be is through consistent and steady action. Through shining your light in the moment, creating with what you have, returning to center, staying present, opening your heart, filling your body, mind and spirit with light, letting light flow into every cell and truly charging yourself up, so that you restore your divine connection and shine as the brilliant divine being you authentically are. Fill yourself up with light to the point where you naturally receive the guidance, intuition and inspiration of how you can serve with joy and love in the highest interest of all. Then act upon your inner inspiration, to co-create, to shine your light in the world, both through your being and through your doing, both through your embodying and through your creating. Through this process of shining light, your growth continues to advance, your ascension continues, the journey continues, one moment and one step at a time as you consciously choose to return to love. Thank you! I hope this short angel message is helpful for you. Keep your heart open, shine your light and remember that you are incredibly loved and supported by the higher realms of light and spirit. It’s up to you to ask for guidance, to ask for support and inspiration and to then act upon the guidance you receive… Flowing your light forth beyond you into the world, to make a difference in the All. Your light is beautiful and brilliant, so let it shine. Shine your light and know how loved you really are. Inspiring! Uplifting! Beautiful Divine Wisdom! Thank you, Melanie! Thank you from the bottom of my heart! Thank you, Melanie for the BEAUTIFUL ARTICLE!